Looking for urban "big city" loft living here in Rochester? Currently, lofts in the city are few and far between and they are scooped up quickly. Even further, real estate that includes the beautiful downtown views are even more rare. Recently, the Rochesteriat was invited inside to see the only unit for sale currently at 1 Capron, which just happens to pair both the "big city" urban loft with those uncommon gorgeous views. If you love unique, urban spaces, this is definitely for you. High ceilings, hardwood floors, and exposed pipes, beams, and brick! ...and oh, did we mention the wine cooler? Even though the ceilings may be over 11 ft tall, this space still feels intimate and cozy. and even a bathroom for your guests (no need to share)! The second bedroom also makes a great office, workout room, art studio, or anything else you can dream up - if you don't have kids or a roommate. Rochester city living can be big and bold just like any major urban center, without having to deal with the dense population. So whether you call it Center City, Downtown, or the Central Business District... you may just want to call it HOME! And just like Manhattan's famous Washington Square Park, Rochester has its very own historic Washington Square Park. Why not live in the neighborhood and be a part of the history and the future of downtown Rochester? If you love the City of Rochester and you want to live more local, then move downtown! Center City living offers what many suburbs can't - you can walk (or bike!) to work (if you work downtown), to restaurants, theatres, museums, parks, shops, and even art galleries (and soon - a grocery store!). More Loft & Neighborhood Details: Unit also includes central air, a laundry room, 1 indoor garage parking spot, 1 parking spot in the outdoor covered lot, and access to the building's rooftop! Hungry and you don't want to walk far? Nikko is on the 1st floor! Contact Tracie Cristofori at Nothnagle Realtors for more information on this unit. Remember that big "Lofts for Sale" sign you used to see when you were crossing over the Freddie-Sue Bridge a few years ago? Well this is that building, 1 Capron to be exact. Close enough to Dinosaur BBQ and Geva Theatre, and tucked into a corner near the overpass of the 490 entrance and inner loop, 1 Capron is a converted warehouse structure repurposed for the city's growing demand for unique urban housing. As part of the newly formed Washington Square Park Community Association, the area is on the mend and has come a long way since its days housing a former natatorium and a free public bath house at the turn of the 20th century. 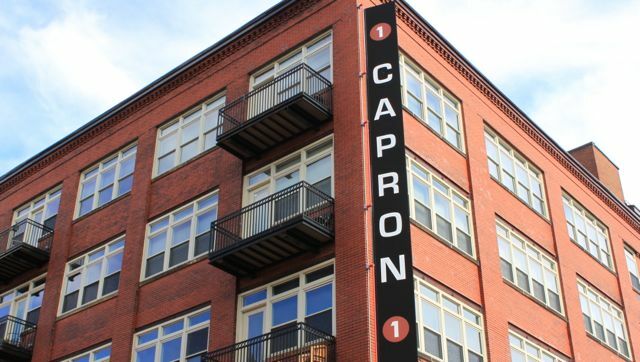 1 Capron, also known as Capron Street Lofts, boasts some of the city's best views from its rooftop deck, a restaurant serving New American fare that includes fresh the Vesper burger on the first floor of the building, and the ability for residents to be within walking distance of most anything downtown has to offer. Next time you're passing on the Freddie-Sue Bridge, you'll now know that there was something done to that "building with that big sign". All units sold out and the building is filled to capacity. To learn more about the neighborhood, contact president@rocwashingtonsquare.org or visit their Facebook page.